It’s finally here! I’m off to Ireland tonight. This will be my first time back in Europe since I left my heart in Rome during study abroad back in 2009! I have to admit: Ireland wasn’t really on my radar (Eeks! Don’t hate me!) It’s certainly not like I was *against* visiting Ireland in any way, shape or form, but rather, I didn’t know much about the country, despite growing up in an Irish family. When my boyfriend Tim and I started dating a little over a year ago, we talked about all the places we want to travel, and for him, Ireland was #1 on his list. So when it came time to plan our first big trip together, it was a pretty easy decision to settle on Ireland. Initially, we planned to tackle both Ireland AND London, England, but ultimately decided with only eight full travel days, it would serve us best to focus on one country. 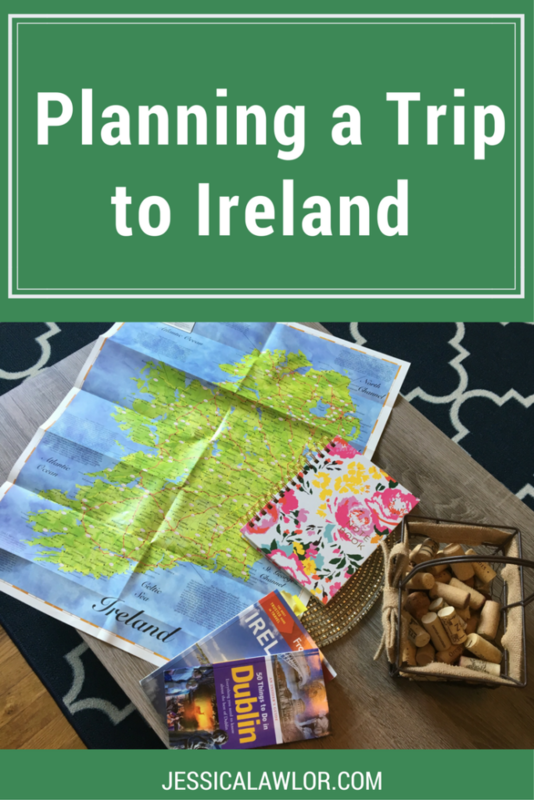 Read on to learn more about our planning process, packing list, how we’ll spend our time in Ireland and what I’ve learned about planning a trip with a significant other. Here’s everything (well, almost everything) you need to know about planning a trip to Ireland. Since I wasn’t super familiar with the country, determining our route was the most challenging part of this process. Naturally, I turned to Twitter, and was instantly overwhelmed by the dozens of recommendations for places to visit. I quickly learned that while folks do love the big cities like Dublin and Galway, the real charm is in the small countryside towns, so we made a point to include a healthy mix of both in our itinerary. A big question to consider when visiting Ireland and planning your route is if you want to drive or use public transportation. Much of my research highly recommended driving to be able to do your own thing and go off the beaten path, so we made the decision to rent a car! However, remember: the Irish drive on the left side of the road, so consider this before you make a decision! I’m very nervous about driving in Ireland, but I hear it’s not as bad as it sounds. If you’re renting a car and you can’t drive stick shift, make sure you choose an automatic car — the default there is manual, so double check before you book! It’s also more expensive to rent an automatic. After reading dozens of blogs about traveling to Ireland, we finally settled on a route. It’s ambitious, but we want to squeeze in as much sightseeing and as much of the country as possible in our short time abroad. Our trip begins and ends in Dublin, so as you can see, we’ll loop around just about half of the country in eight or so days. In my planning, I saw many different variations of this itinerary, including doing the trip counter-clockwise, rather than clockwise, like we’re planning to do. 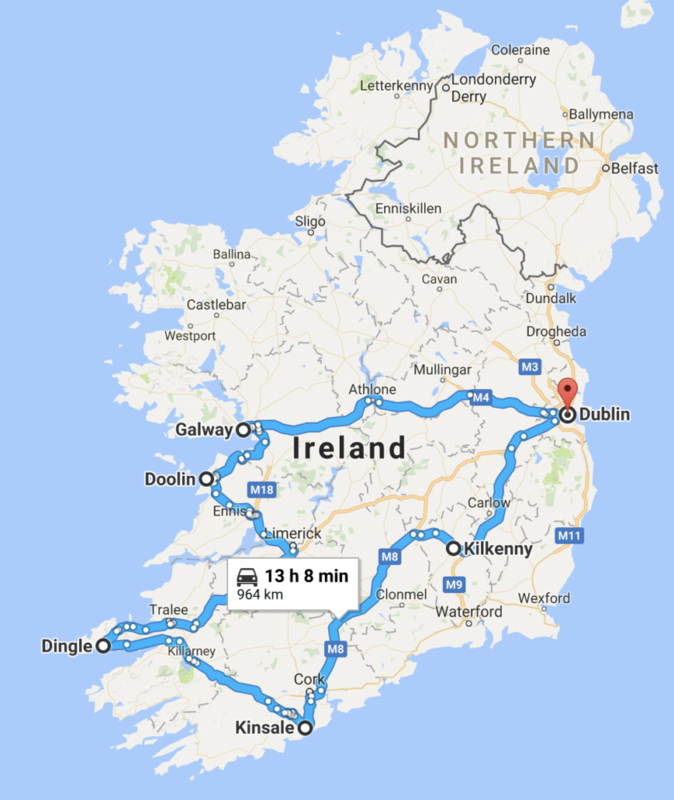 In any case, this route allows us time in two big cities (Dublin and Galway), plus lots of time traversing the countryside and exploring some of the smaller countryside towns. I’m a huge planner, and I have a pretty specific approach to preparing for a trip. First, I turn to Facebook and Twitter and ask for recommendations. I was blown away by how many recommendations I got! This seriously helped with planning and shaping our trip. I then drop all of those recommendations into a Google document. 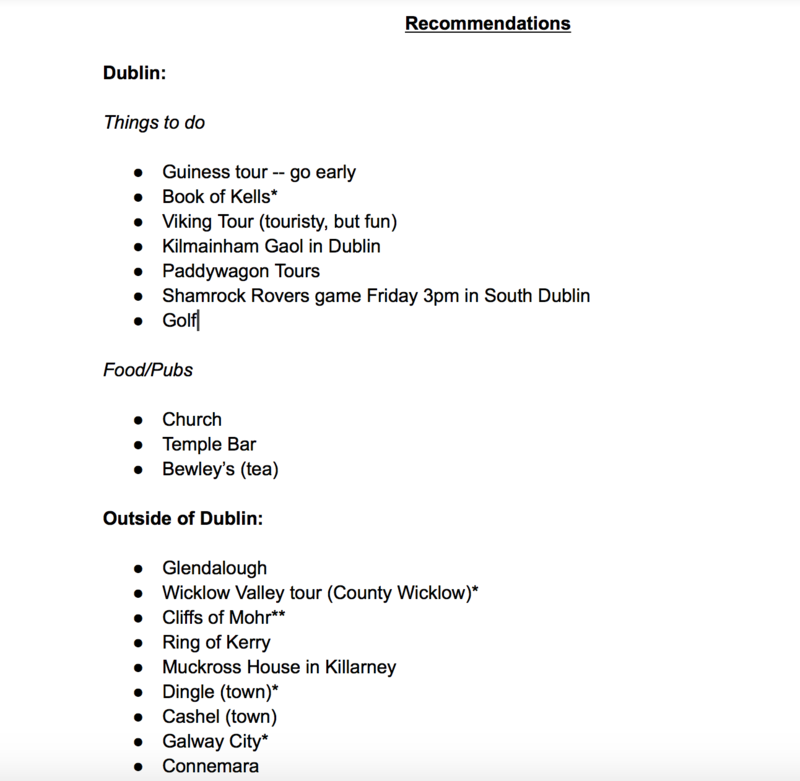 For this trip, I separated recommendations out by spots in Dublin, and anywhere outside the major city. I include brief notes from those recommendations (i.e. “get there early”, “touristy, but fun”) and I put a * next to something multiple people recommended. From there, we did our own research, of course, and figured out loosely some of our “must-dos” and left the rest of our itinerary pretty open to be able to have some flexibility. Now that you’ve seen our route, more specifically, here’s where we’ll be spending each day, and some of what we’ll be doing while we’re there! We fly direct into Dublin out of Philadelphia at night and arrive early in the morning. We’ll have two full days to explore! We’re staying at the newly-renovated Sandymount Hotel, just a few minutes drive outside the city center. All we have planned so far is a ride on the City Sightseeing Dublin hop-on-hop-off bus to get the lay of the land and a tour of the Guinness Factory. I also would love to visit Trinity College (not so much to see the Book of Kells, but to see The Long Room with more than 200,000 books. Some say it inspired a setting in Harry Potter! ), wander St. Patrick’s Cathedral and check out The Temple Bar Pub (come on, I’m always a Temple Owl, at heart). Tim also requested we see a “football match”, so we purchased tickets to a Shamrock Rovers game on our second afternoon in Dublin. On Day 3, we rent a car (wish us luck!) and drive to Kilkenny Castle. If I’m going to Ireland, there has to be at least one castle in the itinerary, right?! Then we head to Kinsale, a colorful town on the southern coast of Ireland. We’ll stay at my first bed and breakfast ever — The Desmond House — #1 rated on TripAdvisor, too! Super excited to soak up that Irish hospitality! On Day 4, we’ll explore Kinsale a bit more and then head off to Dingle, a small port town. I’m a beach gal, so I want to get a taste of Ireland’s beaches, even though the weather will be a bit chilly! We’ll stay at the Cill Bhreac House, another super charming B&B with bay views! We leave Dingle and head to Doolin, a small town highly recommended by bloggers and Instagrammers. We also chose Doolin because of it’s close proximity to the Cliffs of Moher. We’ll stay at Cullinan’s Restaurant and Guesthouse, another highly-ranked B&B on TripAdvisor. Of course, you can’t come to Ireland without seeing the Cliffs of Moher, so we’ll take that in before heading to Galway! I’ve heard rave reviews about Galway, so I’m thrilled we’ll be spending two nights here at the Nox Hotel, a super chic property just a few minutes from the city center. On our final day, we head back to Dublin to return our car and spend one more night in the city! We’ll stay at the Clayton Hotel Dublin Airport, and then hop on our plane early in the morning to come back to Philadelphia. Like I said, it’s a very ambitious itinerary, but geographically, it makes sense and allows us to see a lot of Ireland in a short period of time. I’ll be the first to admit: I tend to overpack. Hey, I like to have options! It’s a bit challenging to pack for 60-degree weather in the middle of a hot Philadelphia August, but here’s what ended up in my suitcase. Let’s hope it works out! As someone who mostly travels with family, I have zero experience planning a major trip with a significant other. Tim and I have traveled to closer destinations together, but never something as massive as a European adventure. It has been a fun process, but also a learning experience, as Tim is very go-with-the-flow and if you know me at all, you know I’m quite the opposite. 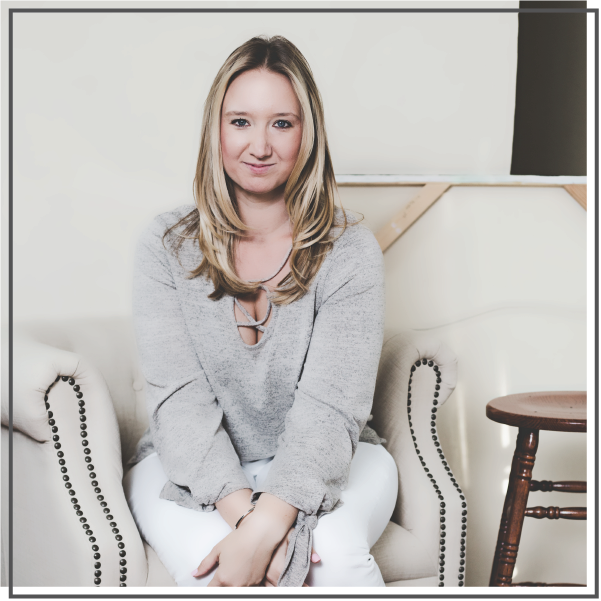 I like to think we bring out the best in each other though; Tim helps me to take a more carefree approach to travel, and I know despite my craziness and level of attention to detail, he appreciates my organization. Create a budget. As soon as Tim and I booked our trip, I created a budget spreadsheet to track who purchases what to make sure we evenly split the costs to keep things fair. Figure out your must-dos. With only so much time, it was important that Tim and I talk over what each of us *really* wanted to do in Ireland. Tim’s must-dos were a round of golf and seeing a football match. My priorities were castles and exploring small seaside towns. Knowing these priorities, we were able to shape an itinerary that includes stuff we both really want to do. Make a plan together. Tim and I both wanted equal ownership in planning this trip. 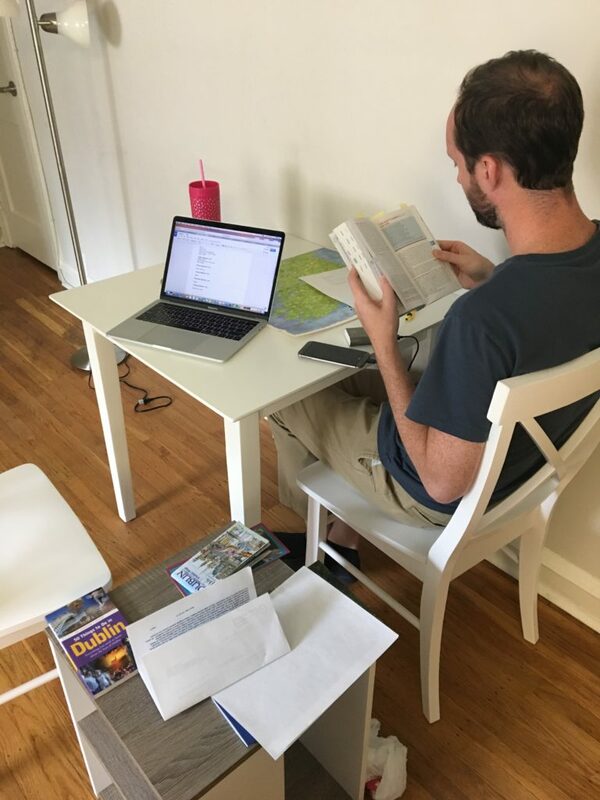 We spent an entire Saturday sitting at my kitchen table reading our guidebook, checking out reviews online and mapping out our route and itinerary. It was a long day, but at the end of it, I truly feel like we built a trip we both really want to go on. Divide the work. After making an initial plan, Tim and I divvied up the work of making decisions and booking. Tim took the lead on booking our hotels, whereas I opted to figure out our B&B accommodations. I spent hours poring over TripAdvisor reviews, whereas Tim booked our Dublin and Galway hotels in no time at all. I had fun seeking out our B&Bs, and I know Tim was happy to make a quick decision on his part of the planning process. Tim was in charge of the car rental and I took the lead on booking a few tours. And we’re off! If you have any last-minute recommendations, be sure to share them in the comments below. I’ll be back with a full report when we return. Have you ever planned a trip to Ireland? Tell me your approach to vacation planning in the comments.